Another student alleges her Facebook post discriminates against white people. Masuma Khan, a Dalhousie University student, is under investigation for an online post on Canada 150 celebrations. HALIFAX — A Dalhousie University student leader says she's facing a backlash for criticizing "white fragility" and standing with Indigenous Peoples on Canada 150 celebrations. Masuma Khan, a member of the student council executive, is under investigation for an online post that another student alleges discriminated against white people. The issue stems from a Dalhousie Student Union decision not to endorse Canada Day celebrations or hold celebratory events on campus. The decision prompted outcry from some groups, like the Nova Scotia Young Progressive Conservatives, who said in a Facebook post the student union "should be helping instill pride in our country, not boycott it on our most significant national holiday." Khan, a fourth-year international development studies student, called the celebrations an ongoing "act of colonialism" and used a hashtag that referred to "white fragility." "Be proud of this country? For what, over 400 years of genocide" she said. "I stand by the motion I put forward. I stand by Indigenous students." Her post prompted Michael Smith, a graduate student in history at Dalhousie, to pen an opinion piece for the National Post newspaper. "Canada is a welcoming country. We are blessed to be one of the most tolerant and multicultural nations in the world, where all individuals are free to pursue their dreams, regardless of their backgrounds," he said in the op-ed. "Canadians have much to be proud of, and plenty to celebrate on this 150th year." Khan, a Muslim woman of colour who wears a hijab, said implicit in these comments is that she isn't from Canada. Masuma Asad Khan pictured with Dalhousie student union president Amina Abawajy holding Black Lives Matter signs on Mar. 21, 2016. 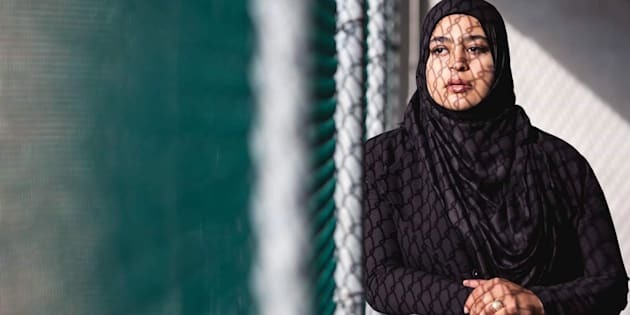 "People assume I'm an immigrant and assume I should be more thankful for what Canada has given me," said the 22-year-old born and raised in Halifax. "I firmly believe that me being a settler to this land and being born in so-called Halifax in the land of the Mi'kmaq, it's my job to stand in solidarity with them and to bring these conversations to the table and work harder towards reconciliation." Meanwhile, Smith, who could not be reached for comment Friday, also lodged an official complaint with the university. The university's senate discipline committee has agreed to hear the complaint. Khan had been a member of the committee, but says she has now been removed pending the outcome of her case. The committee is expected to review the complaint against Khan in November or December. Arig al Shaibah, Dalhousie's vice-provost of student affairs, said the university's code of conduct allows students to raise concerns about behaviour they feel negatively impacts their learning environment and experience. "With complaints of this nature, we engage in efforts to resolve issues through informal, educational and conversational means," she said in a statement. "If individuals involved are not agreeable to informal means to resolve matters, the code dictates that the matter must be referred to the senate discipline committee for a hearing." The university considers both critical dialogue and freedom of expression fundamental principles that guide its work, al Shaibah said. "Respect and inclusion are core to Dalhousie's mission," she said. "That said, these are complex issues, and it is my hope that all campus community members will play an active role in promoting critical and constructive dialogue." But Khan said the complaint against her targets her free speech and identity. "People might say it wasn't an appropriate response. You have to understand I deal with Islamophobia on the daily," she said. "I'm the one that gets called a terrorist when I walk down the street." Pictured is Masuma Asad Khan who says that the idea of needing to take training to talk about race is "incredibly invalidating." "I don't think it's appropriate for the university to tell racialized students how they can talk about their lived experiences," Khan added. "Suggesting I should take some training about how to talk about racism, that's incredibly invalidating." Khan said ultimately she couldn't support Canada 150 celebrations when 172 Indigenous communities currently don't have clean drinking water. Earlier this week, an Indigenous member of Dalhousie's board of governors said she was subjected to institutionalized racism at a recent meeting. Kati George-Jim of the T'Sou-ke First Nation in British Columbia, a student representative on the Halifax university's oversight board, raised her concerns in a lengthy letter she read aloud at a meeting this week. Despite the controversy, the outcome was cited by one board member as a positive step towards reconciliation. Added al Shaibah: "This past week, there have been important conversations, which for me, are fundamentally about issues of respect, inclusion and community. These conversations are difficult, yet they are essential."